Welcome @ Lion Picture dot com! Enjoy wildlife images, pictures and movies! 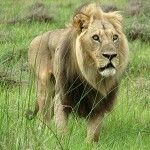 The Lion King of the Beasts (Lion King), if you are lucky you will see Lion on your African safari. It’s always nice to take pictures of Lions in Africa, especially when they are hunting or feeding on a carcass. Most of the time you will see a Lion or pride of Lions on your safari. Sometimes the male Lion will have a pride of more than 20 females + cubs. Good places to see a large Lion pride is the Savute region in Chobe National Park Botswana. Lion are dangerous, stay away from them if you are on footh with a walking safari. As they are the Nr. 1 predator in Africa it’s very easy to get killed by a angry Lion. Howver, most of the time they will run off as soon as they see or smell you. Best National Park to see Lions in Botswana are Moremi Game Reserve and Chobe National Park. 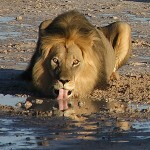 Also the Central Kalahari Game Reserve is a nice place for taking a Lion picture. There you can find the rare black manned Kalahari Lion. Read full article about Lions & general info on Lions & Lionesses here! Please note: all images copyright protected, if you would like to use any of the images available on the website please contact us in advance. Some of the lion images above have been taken at Savute ( Chobe National Park Botswana ). As you can see the whole pride is feeding on a buffalo carcass. The Lion killed the buffalo during the night and we were lucky to find this fresh kill first thing in the morning. Morning game drive are in general better game drives for spotting big predators like the lion. You will see lions during the whole day but they are most active during the cool hours of the day. So if you want to take nice lion images make sure you go on a early game drive. Sometime you will see nothing but if you are lucky you will drive up to a beautiful setting like the one above. All images, digital SLR Canon 300D and a selection of lenses. Older Lion images SLR camera using 400ASA Fuji film, 400mm and 210mm lenses have been used. One of the best lion movies on the web! A very lucky cameraman @ Chobe Savute. The Chobe National Park and especially the Savute region. One of the best paces in Botswana so watch lions at close distance!